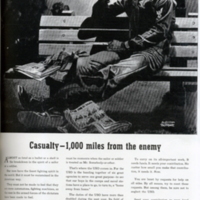 Western CT State University Archives' Digital Collections | USO (United Service Organizations) advertisement; "Casualty - 1,000 miles from the enemy"
USO advertisement soliciting contributions and promoting USO as fostering morale and providing a " home away from home" for servicemen. Albert Dorne (1906 - 1965) was an American illustrator and entrepreneur, and was co-founder of correspondence schools for aspiring artists, photographers, and writers. Dorne was co-founder of the Code of Ethics and Fair Practices of the Profession of Commercial Art and Illustration. In 1943, he was featured on the cover of American Artist magazine, recognized as "one of the best and highest paid in the field of advertising illustration. "He frequently worked for the Johnstone and Cushing advertising agency. Dorne, Albert, 1904-1965. 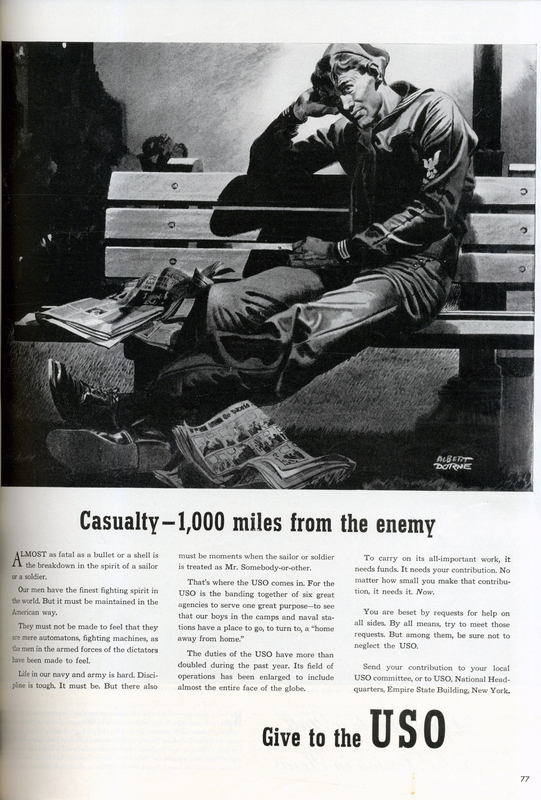 “USO (United Service Organizations) advertisement; "Casualty - 1,000 miles from the enemy".” World War II Advertisements - 1942. WCSU Archives, 26 Apr. 2017. Accessed on the Web: 19 Apr. 2019.